I sincerely hope you enjoyed reading the series of essays provided in our Conference Read Ahead; we asked the authors to write provocative pieces to stimulate your thoughts on how NATO might need to better prepare for future Joint Air Operations. I wanted to take this opportunity to offer my perspective as the Assistant Director on the essays of the Joint Air Power Competence Centre, highlighting many of the topics ­presented by our authors. It will be challenging to generate the political will to respond to adversary actions short of war. Crossing the line from degradation which the ­affected population is willing to accept in order to avoid military conflict into that threshold which generates a cry for national response will be difficult to define and will likely be different for many nations. Even effective ­degradation to highly connected social structures and national ­economies may not exceed this threshold. In any case, it is imperative that the conversation between senior military and political leaders takes place in order to ensure the public is appropriately informed. Building resiliency into NATO’s C2 structure through procedures, training and robust information technology is imperative. Our information networks must endure through a degradation to a certain extent, and, if they ultimately fail, we must retain the capability to effectively execute C2 in an offline or degraded mode. Shortening of the C2 chain, ensuring ­thorough understanding of Commander’s Intent, development of ­standing oper­ation procedures and pre-planned responses will result in the ability to maintain centralized control and decentralized execution even while experiencing some levels of degradation. Civilian casualties and collateral damage will increase as the level of degradation grows more effective. Risk acceptance will need to evolve in an era of degraded precision weapons. Understanding that a level of collateral damage is part of any targeting process and that it is accepted under the Law of Armed Conflict is only part of the problem, it is convincing a world accustomed to near-zero-miss technology that the application of air power will be effected in a degraded environment. Developing the right communications method to generate awareness and ensure the understanding of the political leadership and public is fundamental. Obviously, the technical challenges which will be experienced in a ­degraded environment will be frustrating, from nuisance level cyber intrusions to near blackouts of entire means of communication. This will traverse both the military command structure, the political sphere and the social structure of the general population. Application of ­military power will be effected by anti-access technology, not the least of which is the prevalence of double-digit SAMs which affect all ­domains (air, sea and land) and offer a level of air superiority to an ­adversary in areas which extend over friendly nations. Training will need to evolve to practice operating in a heavily contested and hostile environment, perhaps without unimpeded access to communications, or AWACS or GPS. In fact, with tailored tactics and procedures and ­vigorous training, we might even exploit this degradation for our own advantages as well. The end goal of this conference is not to present or develop solutions to the tactical challenges of how to prepare. That lies within the realm of ­Alliance commanders, at both the NATO and the national level. 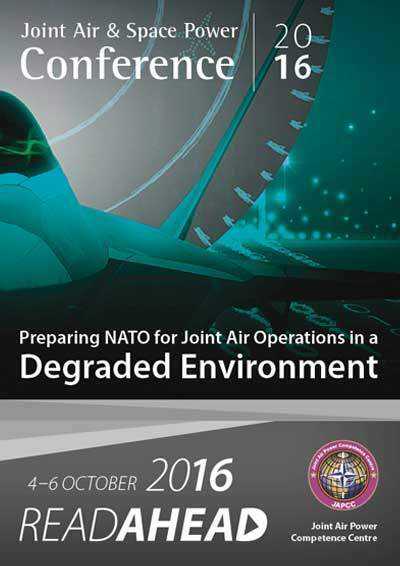 JAPCC hopes to open a dialogue among those senior leaders and their staffs, ­raising awareness of the challenges and considerations of operating in a degraded environment and setting the stage for a move towards the ­preparedness that NATO needs. In closing, I hope you enjoyed the reading and that this has piqued your interest. There is much work to be done in order to better prepare NATO as a force to more capably conduct air operations within a degraded ­environment. I sincerely hope to see you this fall in Essen.